Plaque of Appreciation, You Deserve It! 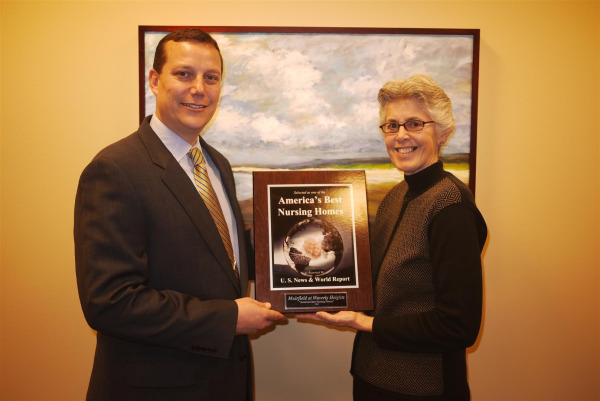 Earlier this week we received word that we had sold a plaque of appreciationto Muirfield at Waverly Heights for being listed as one of the best Nursing Homes in America. The picture was being run in a local paper and we wanted to retrieve it for our "Wall of Fame". Our company has a "Wall of Fame" on our Facebook page where we get pictures from our clients to post and honor them for doing business with us.To be featured in any kind of list takes a lot of hard work and dedication. Well, Meg Guenveur has certainly accomplished this! Above is Tom Garvin and Meg Guenveur holding their plaque! A beautiful plaque if I do say so myself! When I told them that we were going to post the picture on our "Wall of Fame" on our Facebook she made a profile just to check us out! That is so cool!! We love showcasing wonderful acheivements our customers provide us. We want to show everyone that even in the worst of times there is always good news happening! Preserve that memory forever with a Wall Plaque. To receive more information on Mounting and Preserving newspaper or magazine articles. Our company In The News Inc preserves articles from newspaper and magazines turning them into professional wall displays for over 25 years.